This Page will be dedicated to Digital Modes. I am currently using two Radios; IC-7600 and FTDX-3000. The first few articles here will be about my attempts to get these to work, first with RTTY (the “original” Digital Mode, well other than CW of course), then with other Modes. I will post higher-level discussion about Digital modes on the Front Page at KG3V.com, with only the gory details needed to get it working posted here. 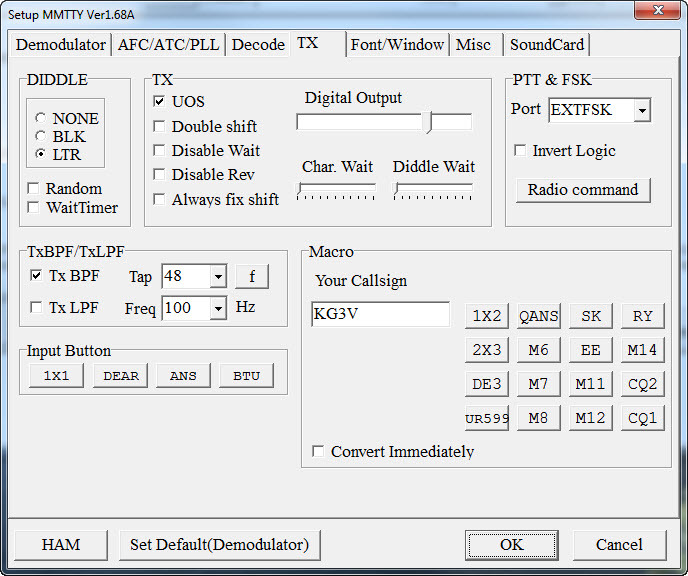 The following provides details and screenshots for using the FTDX-3000 on RTTY with MMTTY and N1MM+ There is now a new Blog post on the Site that gives similar information for using the IC-7600 on RTTY. 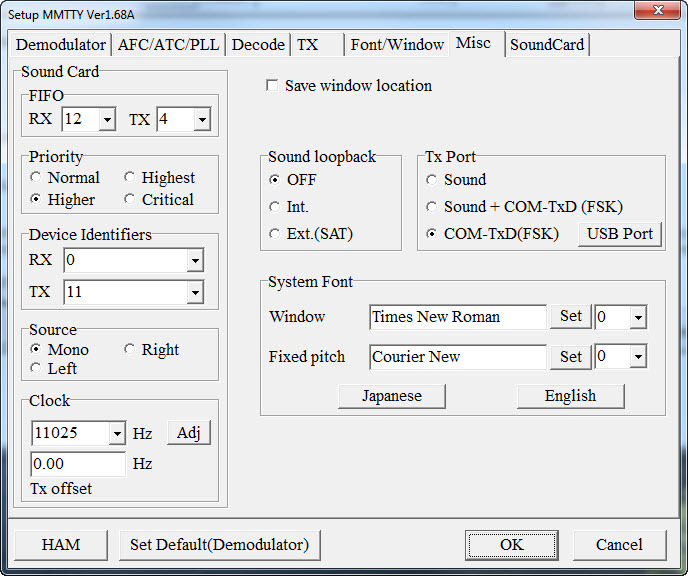 One of the primary Digital Engines in use for RTTY is MMTTY. This has been around awhile. 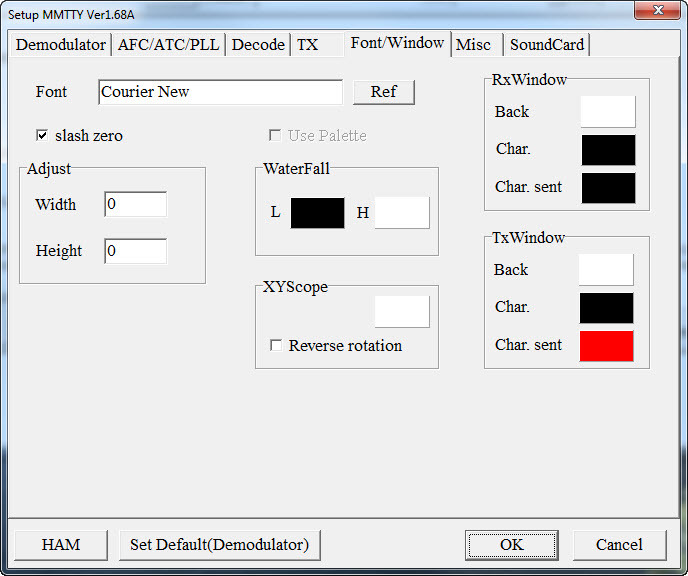 If you can get your radio to work with MMTTY stand-alone (not from inside some other Program), then it should be relatively easy to get it working from other programs such as N1MM+, that are designed to use MMTTY for RTTY. I loaded the Yaesu USB drivers as instructed on the Yaesu site for the FTDX-3000. They installed two “virtual” USB Ports, COM5 and COM6. Your COM ports could be different and you need to know what they are. To find that out, just go to the PC Control Panel, then to the Device manager and look under COM ports. There should be two successive Port numbers with “Silicon Labs Dual CP210x…” listed as the device type. In my case it actually listed Port COM6 before COM5 which seems strange, but may help you find yours. If you are uncertain, you can unplug your USB cable and the correct Ports should disappear in the Device Manager. In this setup you will be using “true FSK,” which means you are NOT using audio tones, but sending digital keying data from the PC to the demodulator inside the FTDX-3000. 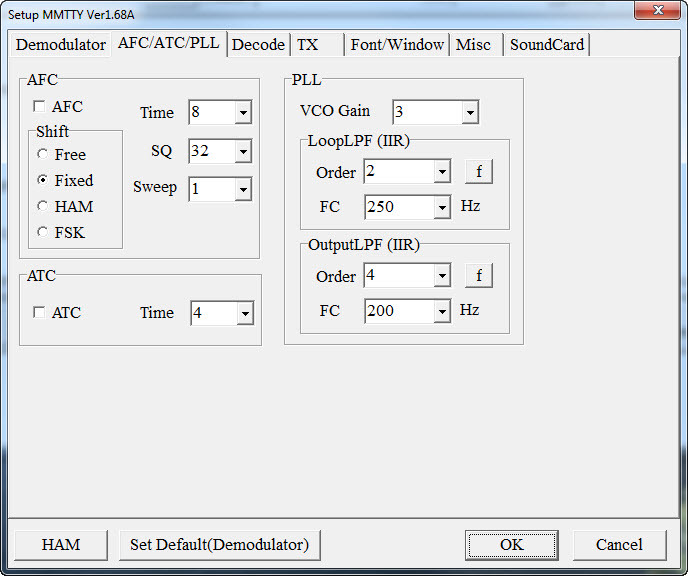 So you must set the Rig Mode to RTTY and NO USB or LSB. 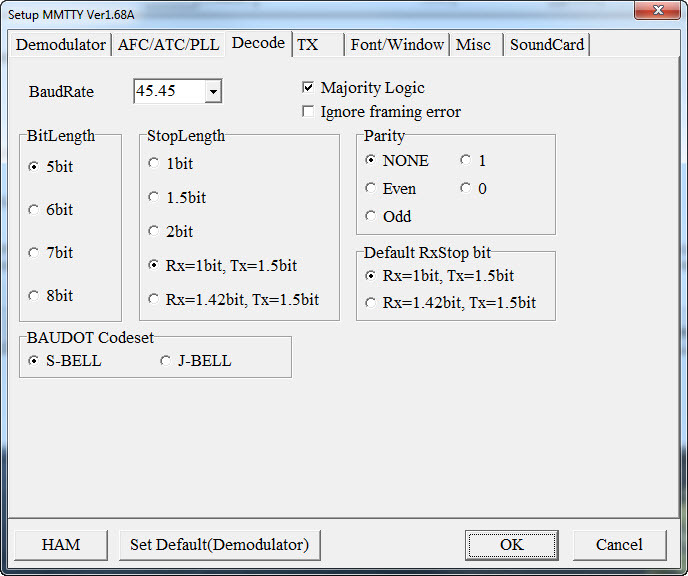 In my case I am using “RTTY LSB” as the Mode on the Rig. There are some other Rig settings that I believe are described in the user Manual, so I will not get into those here. I have also described these in an article on the main KG3v.COM Page. Note that the STATUS here shows as “OK.” If there is some conflict for the Port, you will see red letters saying “STATUS NG” I found this out the hard way, so I will never forget. Below I’m including screen shots of each TAB within the MMTTY Options–>Setup MMTTY dialogue box. These were all taken once I got the setup working on HF. The TABS below are not in order, but I think they are given in most-important first order. By the way, I think I have discovered that I must use “Run as Administrator” to run MMTTY or my changes to settings will not be saved when I Exit MMTTY. On the first TAB (Soundcard), you must select the source of RECEIVED data. 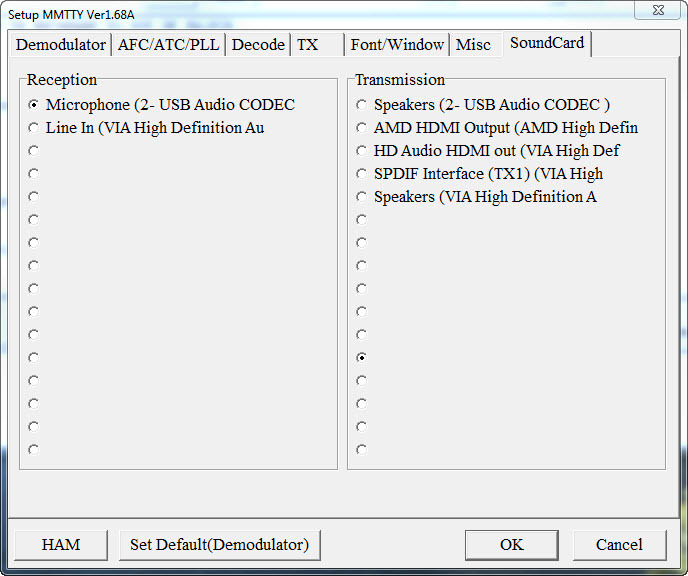 You will have to find the PC-assigned “name” for the soundcard inside your FTDX-3000. In my case it is “Microphone (2- USB AUDIO CODEC)” a terribly generic (and I believe unchangeable) name. The transmit data will not be using the soundcard so you should see the “checked entry” for Transmission is set to none of the Audio sources. The next screen TAB shows Demodulator settings. 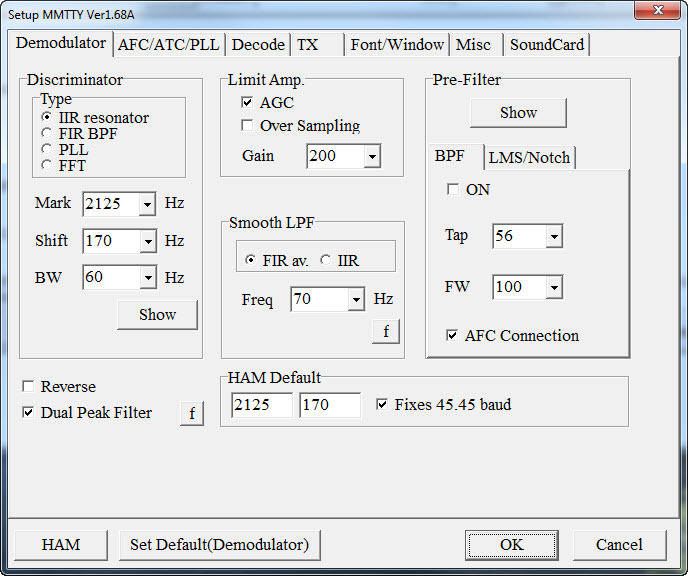 I think I used all Default settings here, but these assume you will be using RTTY Mode on your Rig, with the ability to tune the RTTY signal at 2125 Hz with 170 Hz shift. The next Tab is “TX.” The most important thing here is under “PTT and FSK.” It must specify EXTFSK as the Port for keying. If you do not have this selected, when you Transmit you will only send a continuous carrier at one of the two FSK frequencies. 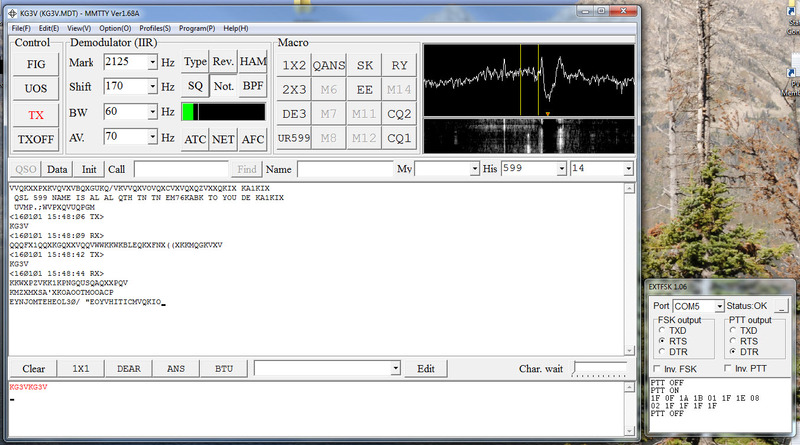 This is the most common problem I have seen many times when I startup RTTY and my settings are incorrect. Oh, don’t forget to input your Callsign and please don’t use mine! Next is the “MISC” Tab. 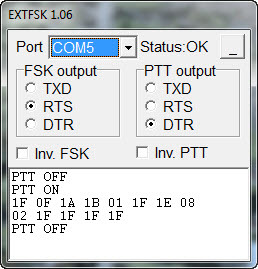 Despite its name, it is important that the “TX Port” be set to COM-TxD(FSK). If you get this all working, here is a sample of how the display screen looks when you Startup MMTTY. Hope you got it working. It seems to work fine for me. Have fun on RTTY. I have been doing some work on other modes for awhile. Finally getting back to trying some RTTY in the Feb 2017 CQ WPX RTTY contest. Here is a look at the screen (actually across 2 monitors), for my two-radio setup. I am using the ICOM IC-7600 and the Yaesu FTDX-3000. Hi, thanks for the info about your settings, as I’m also in the process to configure the FTDX 3000 (recently bought) with mmtty. Well that’s the same as yours for true FSK transmission. control panel / material and audio / sound / manage audio devices / select the yaesu 2 USB audio codec / properties / and change the name for a more easy one to memorize. When I’m monitoring the transmission in FSK (RTTY LSB mode) with the yaesu monitor switch ON , it seems to have a sort of ‘white’ sound above the FSK transmission in the headphones . Not very pleasant to listen. That’s not the case if I configure mmtty to work in AFSK mode ( DATA LSB on the 3000) . Do you experience the same ? By the way it seems to make no difference on the air as I made severals QSO and didn’t get any obsevation about a bad sounding rtty signal. But many uses only macro so… who knows ?